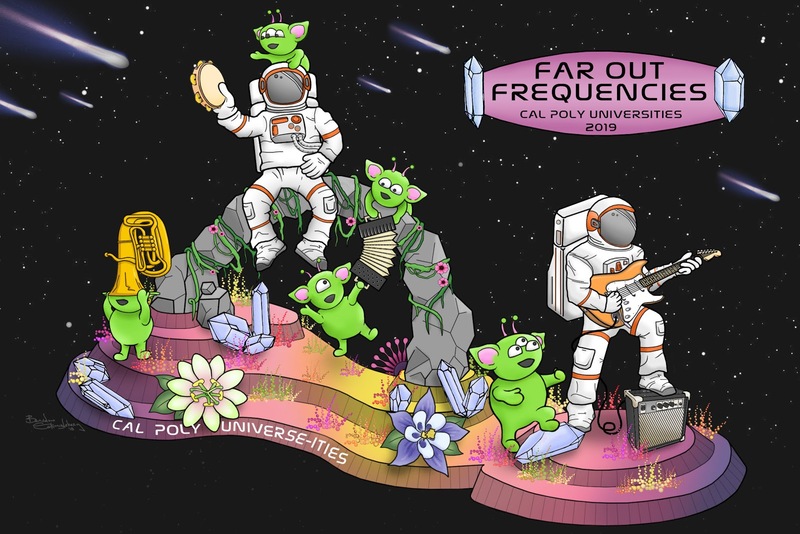 SAN LUIS OBISPO — Cal Poly Rose Float announced the 2019 Cal Poly Universities’ Rose Float entry, “Far Out Frequencies,” featuring a pair of astronauts and a handful of alien friends on another planet communicating through music. The design was the top choice, from 150 submitted entries, of the Cal Poly Rose Float team and their counterparts in Pomona at California State Polytechnic University. “Far Out Frequencies” celebrates the 130th Tournament of Roses Parade theme, “The Melody of Life,” and music as a universal language. On the float, astronauts Morgan and Sally travel deep into outer space and land on a distant alien planet. Unable to communicate through language, they use musical instruments to share their message of goodwill with the aliens they encounter, leading to out-of-this-world fun and some unexpected good times. The Cal Poly Rose Float, the only student-built entry in the parade, has been invited to participate for 71 consecutive years. The students’ commitment to Learn by Doing reveals the dedication of each university’s leadership team to creating a unique entry. Since 1949, students from the two campuses have come together across 240 miles to produce one of only a handful of self-built floral floats for the Tournament of Roses Parade in Pasadena, Calif., on New Year's Day. A symbol of this partnership is the float’s frame, whose front and back halves are joined mid-October each year in Pomona to officially unite both the float and the teams. Until the day of the parade, the nearly 100 student team members will work nonstop to create an entry that inspires, impresses and ultimately wows Rose Float members, alumni, the judges and millions more around the globe. Construction of “Far Out Frequencies” began on the San Luis Obispo campus in July, and work will continue each Saturday through mid-October, when Cal Poly’s half of the chassis and other float parts will be taken to Pomona. Once there, members of both teams will work together, competing against the calendar, to complete the float in time for the Pasadena classic that will roll along Colorado Boulevard on New Year’s Day. Animation on the 2019 float will include: one astronaut strumming a guitar, tapping his foot and bobbing his head; two aliens playing an accordion; another attempting to lift a tuba off its head; and much more. Students grow and harvest a portion of the plants from the on-campus Rose Float flower fields. These include marigolds, strawflower and statice, which will be used as colorful decorations. The entries over the years reveal a commitment to California’s flower farmers. The 2018 entry marked the seventh consecutive year that their float earned the “California Grown” designation from the California Cut Flower Commission, which recognizes an entry decorated with at least 85 percent of cut flowers and plant materials from the Golden State. The two universities’ entries have earned more than 50 awards since 1949, including their milestone 70th float, “Dreams Take Flight,” which received the Past Presidents Trophy for the most outstanding innovation in the use of floral and non-floral materials at the 129th Rose Parade earlier this year. Founded in 1901 and part of the renowned California State University system since 1960, Cal Poly is a nationally ranked, four-year, comprehensive polytechnic public university located in San Luis Obispo, Calif. Known for its Learn by Doing approach, small class sizes and open access to expert faculty, Cal Poly is a distinctive learning community whose nearly 22,000 academically motivated students enjoy an unrivaled hands-on educational experience that prepares them to lead successful personal and professional lives. For more information, visit www.calpoly.edu.